Not without certain compromises, this is a simple, great-sounding and well-conceived looper that'd be ideal to get you started. Simple to use. Compact size. Its nano size has the potential to cause some playing headaches. Looping has many benefits for guitar players, but a downside to the whole concept is that the relevant equipment can be rather complicated. It often needs to be, and even a cursory look at floor-based products such as the Boomerang III Phrase Sampler or the Boss RC-300 Loop Station can send those of a less technical outlook running away in a panic. 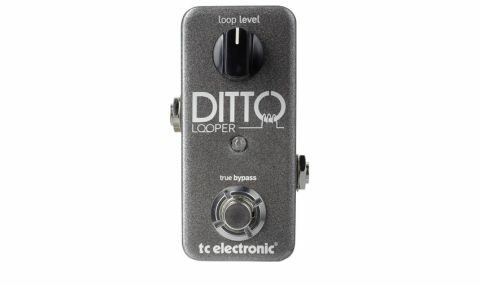 TC Electronic has taken this perception to heart with its new Ditto, having removed all the "non-essential, mood-killing tech hoopla", as TC describes it, to produce a looper intended for use solely by guitarists. "As a 'plug in and loop' concept, the Ditto is simplicity itself, with just an LED, loop level control and footswitch"
As a 'plug in and loop' concept, the Ditto is simplicity itself, with just an LED, loop level control and footswitch adorning the tiny 'nano'-sized chassis. At 92mm in length, the Ditto measures the same as TC's PolyTune Mini, and, like the tuner, the case is actually too small to enclose a standard PP3 nine-volt battery. TC tells us that most remote power adaptors should be sufficient. The heart of the operating system is the unassuming LED, the colour of which depends on what function the pedal is performing. Press the pedal once to record and the LED glows red; tap again to end the recording, and it changes to green. From there, you can play the loop and noodle along in real time, or add infinite overdubs to build up parts. A quick double-tap stops the playback. In addition, the Ditto offers true bypass and Analog- Dry-Through, which allows the uneffected dry signal to be constantly running through the pedal, and a currently redundant USB port. "At this point, the port has no function," TC's Kim Bang tells us. "But if future firmware/ software updates should occur, this would be the way to update the pedal." Imagine using TC's TonePrint program to download and utilise loops supplied by a choice of your favourite player. Interesting. "Thanks to the 24-bit uncompressed audio processing, we overlaid 23 loops without any discernible loss of playback quality"
The pedal's modest dimensions may not take up too much room on a cramped pedalboard, but we did find its size occasionally compromised how easy it was to use, at least until we got used to it. When standing over the Ditto poised to loop, our modest size 10s tended to obscure the LED, and since timing is a key component of seamless looping, this could be an issue. With the combination of sound quality and ease of use, we can't help but be impressed with the Ditto Looper, though it is limited in comparison with other pedal-based loopers out there. And while the price doesn't include a power supply, and its modest proportions may mean some operational compromises, there's little chance of any confusion in regard to how you actually use it. A looper for dummies? Why make life difficult?